↑ Rohit Manchanda (25 November 2011). 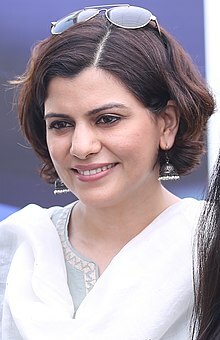 "TV journalist Nidhi Razdan speaks about her life and success". The Weekend Leader. Retrieved 19 August 2013. ↑ Left, Right and Centre: 'Nitish Kumar Should Head The Congress': Ramachandra Guha. NDTV. 12 July 2017. 18 minutes in. Retrieved 17 July 2017. ↑ LSR Journalism Prospectus 2012, see page "Some of Our Alumni"
↑ "Actual romance blooms in small towns: Neelesh Misra". IndiaGlitz.com. Nov 29, 2005. Retrieved Nov 26, 2014. ↑ "Nidhi Razdan in EMMRC and MERC". EMMRC University of Kashmir. Retrieved 19 August 2013. ↑ Vijay Kumar (25 January 2010). "J&K Government announces 28 State Awards 2010 for bravery, literature, arts, Journalism, crafts". Scoop News. Archived from the original on 5 August 2014.